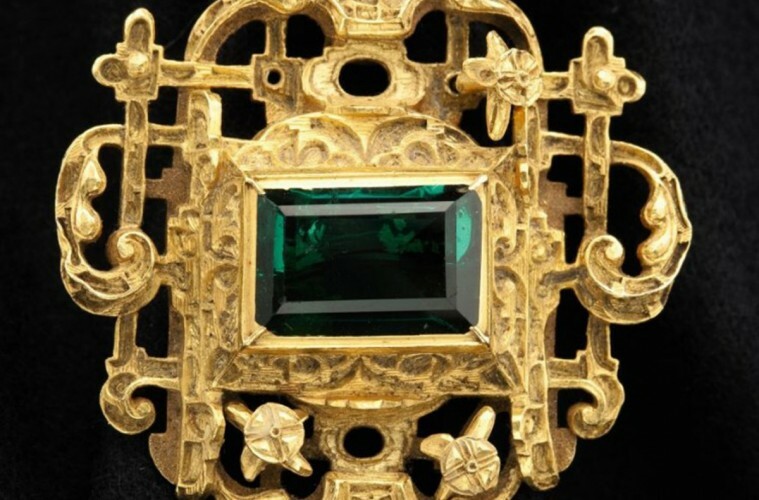 Part of the treasure of the Spanish galleon Nuestra Señora de Atocha, which sank off the Florida coast in 1622 after sailing into a powerful hurricane, will be auctioned off in New York on Aug. 5 by Guernsey’s auction house, on the 30th anniversary of its discovery by U.S. treasure hunter Mel Fisher. Almost 40 objects from the galleon, including an emerald cross, gold and silver bars, precious natural pearls and Spanish 17th-century coins, will go to the highest bidder. Nuestra Señora de Atocha was the most famous of the nine Spanish shipwrecks in Florida waters, one that treasure hunters tried to find for more than 150 years before Fisher, with remarkable persistence, came upon it off Florida’s Marquesas Keys in 1985. In his 16 years of searching, Fisher found 40 tons of silver and gold, including 100,000 silver coins known as “pieces of eight,” others of gold and a number of the finest Colombian emeralds, all part of the booty that Spanish explorers were taking home from the New World. The upcoming auction will sell some of the articles most treasured by Fisher, who died in 1998 at age 76. The most valuable pieces are a golden chalice valued at between $400,000 and $500,000 (359,000 to 449,000 euros), two splendid natural pearls from the Nueva Esparta region – valued at between $300,000 and $400,000 (269,000 to 359,000 euros) – and an emerald and gold cross, intended as a gift from King Philip V of Spain to his wife Elizabeth Farnese, duchess of Parma, which could be knocked down for some $125,000 (112,000 euros). But perhaps the most curious is a gold chain that Mel Fisher himself wore when he was interviewed on “The Johnny Carson Show” after he found the haul, and which is valued at between $90,000 and $120,000 (80,000 and 107,000 euros).